Visitation for Jeanne E. Solie, 100, of Saddlebrook Farms, formerly of Riverwoods, will be held from 3:00 pm until 8:00 pm on Thursday, March 21, 2019 at the Ahlgrim Family Funeral Home, 415 S. Buesching Road, Lake Zurich. A Funeral Mass will be said on Friday, March 22, 2019, 10:30 a.m. at St. Francis de Sales Catholic Church, 33 S. Buesching Road, Lake Zurich. An Entombment will follow at Memory Gardens Cemetery, Arlington Heights. 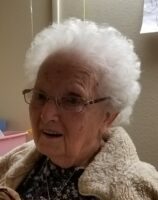 Jeanne was born on December 29, 1918 in Wilmont, MN and passed away on March 17, 2019 in Wauconda, IL. (the late Carlos) Lopez and Diane (Larry) Poe; grandmother of Michael (Lauren) Lopez and the late Jason Lopez; and loving Aunt to innumerable nieces and nephews.